Fields of Valor - Collection 7 - "Heroes of Elswin"
Character Bio:A gust of bitter wind blows in from the north. Private Richard Chapman, of the Airborne Elite, pulls his arms tightly around himself in an attempt to shut out the chill. This cursed wind blew him off of his drop zone and now he’s been separated from the rest of his squad. Chapman scans the horizon looking to spot his allies, when a flash of red catches his eye. The soldier quickly readies his rifle and attunes his senses to his surroundings. He feels something moist hit him on the forehead; reaching up, he touches the wet spot. “Rain...”, he mutters to himself, as it begins to poor in sheets. Lightning streaks across the sky. The soldier’s heart jumps in his chest! The black form of a masked man, illuminated by the lighting strike, stands directly in front of him, and then in the same instant disappears from sight. Chapman frantically twists his head from one direction to another, but cannot spot the figure. In his peripheral vision the soldier catches another flash of red. Cursing, he turns and fires, to no avail. Nothing is there. 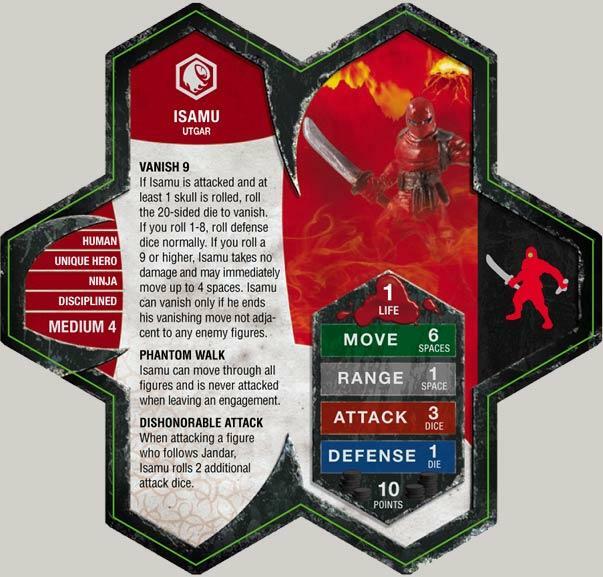 When using Vanish 9, can Isamu’s movement be enhanced by anything like roads, or auras to increase the amount of spaces he can move? Does Isamu have to move in order to vanish? If Isamu cannot move because of a special power like the Gladiatron’s Cyberclaw (or any other move inhibiting power) can he still use Vanish 9? If Dead Eye Dan attacks Isamu with his Ullar's Enhanced Rifle and rolls a skull, can Isamu still use Vanish 9? If The Rechets of Bogdan successfully roll all skulls, activating their Sting power, can Isamu still roll for Vanish 9? As a Unique Hero that follows Utgar, Isamu may benefit from Ornak’s RED FLAG OF FURY activation synergy. Having a Disciplined personality, Isamu may aid the Sacred Band with their DISCIPLINED ARMY DEFENSE BONUS. As a Unique Human, a destroyed Ebon Armor you control may be placed on Isamu's Army Card to replace Isamu upon his own destruction. As a Ninja, Isamu may benefit from Kantono Daishi's DISHONORABLE LEADERSHIP activation synergy. As a Medium Unique Hero, Isamu may benefit from Myrddin's 20-sided die enhancement. This guy will be broken in a week. Pretty much every army from now on will use Isamu as a filler unit. All he has to do is kill one measly squad figure to earn at least his pt value. Most likely if used correctly, he will earn is points many times-fold. His ability is really decent as it will allow him to survive a hit or two. His phantom walk and attack boost are just icing on the cake. Can't wait to have him in my army. Ten Points... dang! This guy is WAY too good for ten points. Put him next to a Blade Grut or something. You'll see the difference. This guy is amazing! And for 10 points, you just have to pick him. Once I get him, I swear I will use him in every game. There's just no way he can't earn his points worth. And if you use him against an all Jandar army, he'll wreak havoc. But one misrolled D20 will lead to his demise... but for 10 points.... I'll take that risk! This guy has to be the most insane value in the game. 10 points for a potential 5-dice attack is amazing, and the 6 move will come in very handy too. And to top it all off, his "disappearing ninja" ability will prove quite a headache for opponents. Actually, he has the potential of having 6 attack, since hight is not that hard to get. It's almost impossible not to have height when you have 6 move, 'Vanish', and 'Phantom Walk'. This guy should have cost 25 points, IMHO. Look at the Dumatef at 25 points! This ninja is MUCH MUCH MUCH better than a Dumatef, and he's 15 points less? That being said, I can't wait to try him out and/or see him in action tomorrow!!! Isamu is a male Japanese given name. Yeah, but he only has one life with one defense die. One failed 'Vanish' and he's gone. But the Dumatef has a respectable 4 attack/4 defense, possible of 5 defense. Plus, Dumatef can benifit other figures. But I think in about a week or so we'll truly see how broken Isamu is. He’s like a paper tissue with a razor blade. He’s got one goal in mind- cripple one of Jandar’s heroes before he dies. Vanish 9 is good against Special Attacks as well. Phantom Walk condensces two previous abilities into one. Insane all that for 10 points.